An accounts receivable (AR) aging report shows all unpaid customer invoices grouped by the number of days outstanding. If you use an online accounting software you can create this report in a few minutes. Otherwise, you can create it manually in a Microsoft Excel spreadsheet. To avoid delinquent invoices, review this report monthly and follow up with your customers. If you are dealing with the aging of accounts receivable in your business, sending automatic reminders to customers, accepting online payments from customers and offering early payment discounts can help you to get paid much faster. Better yet, FreshBooks allows you to do all of these and more. Take FreshBooks for a free test drive to see how much easier it is to invoice and collect payment from your customers. The primary purpose of an AR aging report is to keep track of unpaid customer invoices and the number of days they have been outstanding. If you invoice customers for products and services and allow them to pay you sometime in the future, you need to keep track of when each invoice is due so that you can get paid in a timely manner. An AR aging report provides you with the total amount of outstanding customer invoices. A summarized AR aging report will have one grand total for each customer broken up by the age of the invoice. The invoice age will be broken into four or five groups: 0-30 days, 31-60 days, 61-90 days and more than 90 days. You should generate an AR aging report at least once a month if not more often. This allows you to stay on top of invoices that are coming due so that you can remind your customers that an invoice is coming due or notify customers of invoices that are past due. If you use an accounting software like FreshBooks, you can generate an AR aging report in just a few minutes. You can also create one manually using Excel or Word. In the screenshot below, we have a sample report that shows a total accounts receivable balance of $725.00. AR Aging report created in FreshBooks. Compared to other accounting reports, the AR aging report is fairly easy to understand. Most accounting software like FreshBooks have both a summary and a detail report that you can run. The detailed report is the one you will need to use to follow up with customers. We will talk more about how to use this report to collect payment in the How to Get Paid Faster section. Below is an example of an AR aging report that we ran in FreshBooks along with a description of the information in this report. Date – This report includes invoices that are current and past due as of November 3, 2017. Client – This column includes the name of each client. 0-30 Days – Invoices in this group are between 0 and 30 days past their due date. In our sample report, Fred Flintstone has invoices that total $500 and Barney Rubble has outstanding invoices in the amount of $225 in this group. 31-60 Days past due – Invoices in this group are between 31 and 60 days past their due date. In our example, there are no outstanding invoices in this group. 61-90 Days past due – Invoices in this group are between 61-90 days past their due date. In our example, there are no outstanding invoices in this group. 90+ Days past due – Invoices in this group are between 61 and 90 days past their due date. In our example, there are no outstanding invoices in this group. Total – In this column, we have a subtotal by client, Fred Flintstone ($500) and Barney Rubble ($225). This row subtotals the outstanding invoice amount by aged group: 0-30 Days ($725), 31-60 Days ($0), 61-90 Days ($0) and 90+ Days ($0) and then a grand total accounts receivable balance of $725. Positive cash flow is a key ingredient to staying in business. In order to have positive cash flow, you must stay on top of your outstanding customer balances by reviewing your AR aging report so that you can take action before an invoice becomes past due. There are a few other best practices that you can implement to get paid faster. 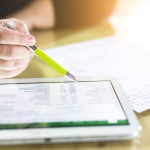 If you are currently using an Excel spreadsheet or Word to manage your open invoices, we recommend that you make the switch to cloud accounting software. If you use an accounting software like FreshBooks, it will allow you to automate the invoice and payment process. With FreshBooks, you can send automatic payment reminders, set up recurring invoices and allow customers to pay their invoices online. If you invoice several customers and would like to put invoice and payment process on autopilot, sign up for FreshBooks to help you streamline your accounts receivable process. If your standard payment terms are net-30, a good rule of thumb is to review your AR aging report at least on a monthly basis. However, if you have payment terms that are net-7 or even net-14, then you should review your AR aging report on a weekly or biweekly basis. Each time you review the AR Aging report, you should take the necessary steps to collect payment on all invoices. While you might think that you don’t need to take action on invoices that are not yet due, I disagree. If you use an accounting software like FreshBooks, make sure that you take advantage of the payment reminder feature. Once this feature is turned on, FreshBooks will send out an email reminder automatically to customers before an invoice is due. I recommend that you set this reminder to go out at least two days before the invoice due date. Like you, your customers have many responsibilities and would actually appreciate the reminder. By this time, you should have sent one reminder before the invoice is due and another reminder a day or two after the due date has passed. Once an invoice is seven days past due, you should be making weekly phone calls to follow up on payment. Unless a customer has made payment arrangements with you, invoices in this group should be on a weekly call list. If you are still providing goods and services to customers who have invoices that are 60 days past due, you should consider putting their account on hold until they have either made payment arrangements or paid their account in full. Otherwise, you simply run the risk of having a much larger amount that you may never be able to collect on. If customers have invoices older than 60 days their account should be on hold, meaning you are no longer providing goods and services to them. The only exception to this is if they have made payment arrangements and are keeping up with the agreement made to get their account back in good standing. However, if your customer has not made any kind of effort to make good on their delinquent balance, it’s time to take legal action. If you have invoices on your books older than 90 days past due, most likely you are not going to get paid for them. My recommendation is that you close the customer’s account so that they can no longer place orders with you. In addition, if a customer does want to pay off their balance and purchase from you again, you should consider putting that customer on C.O.D. (cash on delivery) or at the very least require a deposit before you perform any work. If you just don’t want to have to deal with payment collections in your business, I recommend that you hire an accounts receivable manager who can take care of this for you. Check out our article on How to Manage Accounts Receivable which includes a section with tips on hiring an accounts receivable manager. Consider offering customers an incentive to pay their invoices before the due dates. Early payment discounts can be a great way to reward clients who typically pay on time to send in their payments early. In addition, it could also motivate the customer who is consistently late to start getting those payments in sooner. Check out our article on Understanding Early Payment Discounts to learn how they work. The key to getting paid faster is to be proactive! Most cloud accounting software programs allow you to set up automatic payment reminders that will go out either before a customer’s invoice is due or immediately after. We recommend that you send a reminder out at least one to two days prior to the invoice due date. If the invoice is not paid by the due date, send another reminder within two to three days after the due date if the invoice still remains unpaid. Another benefit of using cloud accounting software like FreshBooks is you can email invoices directly from the software. This ensures there is no delay between the time you send the invoice and when your customer will receive it. Once you click send, it’s in your customer’s inbox in just seconds. With most cloud accounting programs, you can keep track of when an invoice has been viewed by your customer and when they have submitted payment online. It’s important to deliver accurate invoices to your customers if you want them to pay you on time. Every business has a different way to deal with wrong payment information they’re provided, and your customer may slow down the process just trying to get a detailed response to your invoice. Instead, learn how to write accurate invoices and deliver them in a timely manner to every customer. If you offer customers the option to pay their invoices online, you will increase your chances of being paid much faster. This is another benefit to using invoicing software like FreshBooks. Every time you email your invoice to a customer, it will include a Payment button that your customer can use to make their payment with a credit card or Visa debit card. With FreshBooks, you can implement all seven of these tips to get paid faster and maintain positive cash flow. It only takes a few minutes to sign up for a FreshBooks account – no credit card required during the trial period. Having key insights into the overall health of your business will give you the information that you need to make solid business decisions and attract potential investors. In addition to the accounts receivable report, there some additional reports that you should review. The accounts payable aging report is identical to the AR aging report except that it includes outstanding bills that you owe to your vendor suppliers. It is broken down into the same categories as the AR aging report: 1-30 days, 31-60 days, 61-90 days and more than 90 days. Check out our article on how to manage accounts payable to learn more. The profit and loss report — also known as the income statement — shows a summary of income and expenses for a period of time, such as from January 1 to January 31, 2018. The difference between income and expenses is calculated as the net profit or loss on this report. Sign up for our profit and loss webinar to learn more about how this report works. The balance sheet report summarizes all of the assets, liabilities and owner’s equity for a business as of a specific point in time, such as December 31, 2018. Sign up for our free balance sheet webinar to learn more about how this report works. The statement of cash flows keeps track of all cash transactions and categorized them into three categories: operating activities, investing activities and financing activities. Sign up for our free statement of cash flows webinar to learn more about how this report works. An AR aging report can help you to stay on top of unpaid invoices so you can collect payment in a timely manner and avoid the additional costs of hiring a collection agency. If you’re looking for a software that will support your goal of getting paid on time, we recommend FreshBooks. With FreshBooks, you can put your invoice and payment collection on autopilot and get back to doing what you enjoy most. Sign up for a free 30-day trial and check it out for yourself. Hi Saravana, since I’m not quite sure what system you are using it is a bit difficult for me to answer your question. My guess is that this means only show the customers that you owe money to (meaning that they somehow overpaid you). Again, because I don’t have much context, this may not be the right answer but it is my best educated guess.